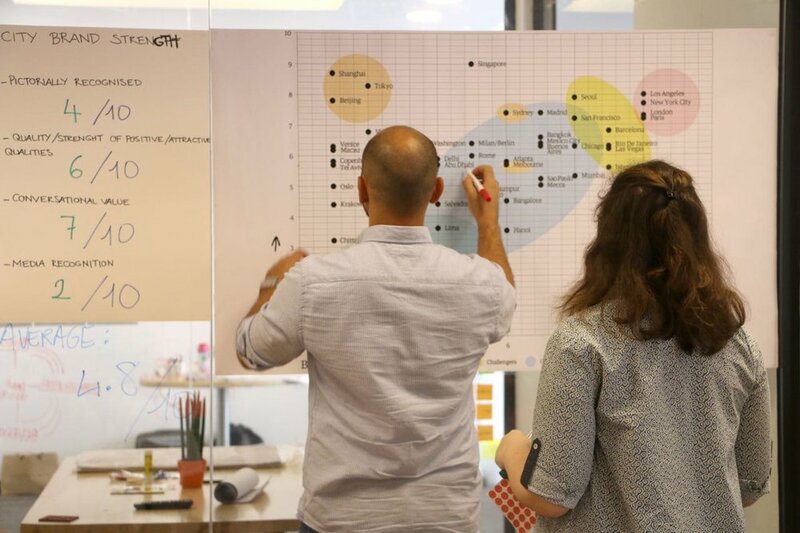 Still continuing with our Beirut Design Week events, we gathered on Thursday for a City Branding Workshop, in order to figure out solutions to make Beirut a more livable city. Soon after Blue Hat’s offices started filling up in the morning, Blue Hat’s co-founders Judy Maàmari and Sami Hmaidan gave a small word and introduced our Partner from Istanbul, Elif Taş. 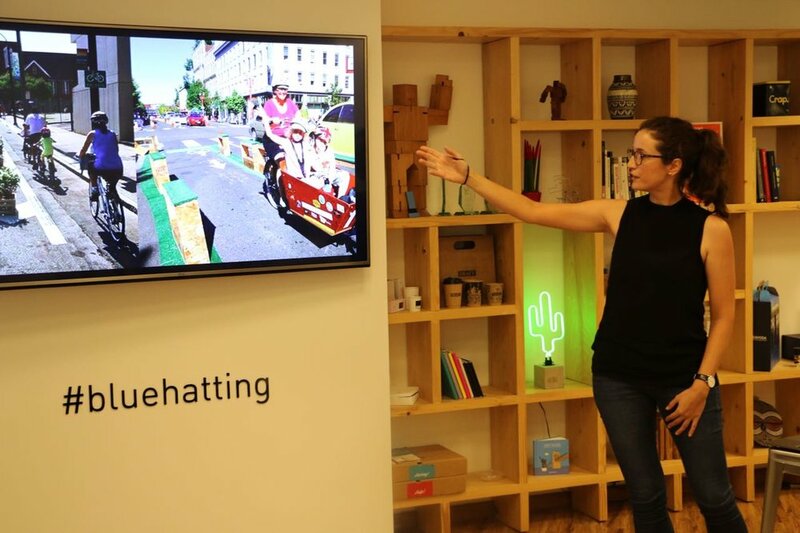 The participants, along with Blue Hat’s team, were then asked to introduce themselves, state two or three of their lovemarks, then state a city they love. The participants were then asked to jot down some ideas while enjoying breakfast. 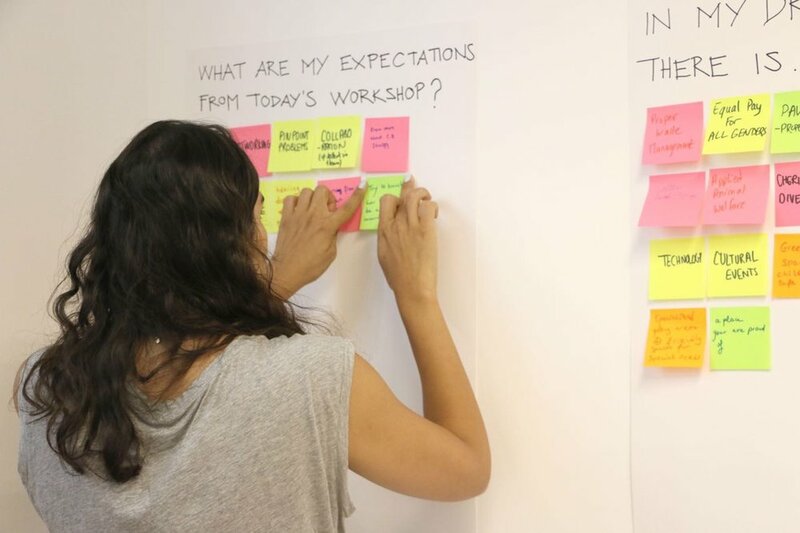 Two blank posters titled “In my dream city there is…” and “What are my expectations from today’s workshop?” were stuck on the wall where participants were asked to add their ideas on sticky notes. Soon after, all participants took a seat to listen to Taş explain the workshop’s aim and introduce warm-up exercises. Taş, Hmaidan, and Maàmari first handed out papers on which participants had to link cities with famous festivals or events, as well as their respective slogans. When this exercise was done, the co-founders handed out papers with questions about Beirut based on the ‘round robin’ naming exercise. Each paper had one question, totalling in 15 questions. Participants were asked to write down a quick answer, taking no longer than 30 seconds, then pass the paper to the person to their left to write another answer. After warming up, all participant joined forces to rank the city based on the international scales of The Saffron City Brand Barometer, divided into two categories: asset strength and buzz strength. These categories had subcategories in them like ‘cuisine & restaurants’, ‘good weather’, ‘ease of getting around on foot or by public transport’, and ‘media recognition’. Each was rated over 10, and their averages were rendered over 10 in order to place Beirut on two axes. 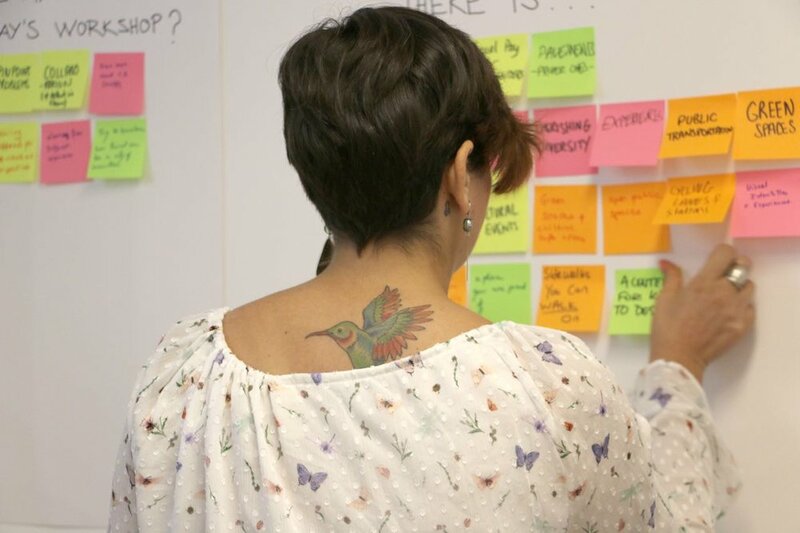 This exercise helped participants pinpoint the problems the city suffers from in order to decide on which one to focus on solving for the rest of the workshop. 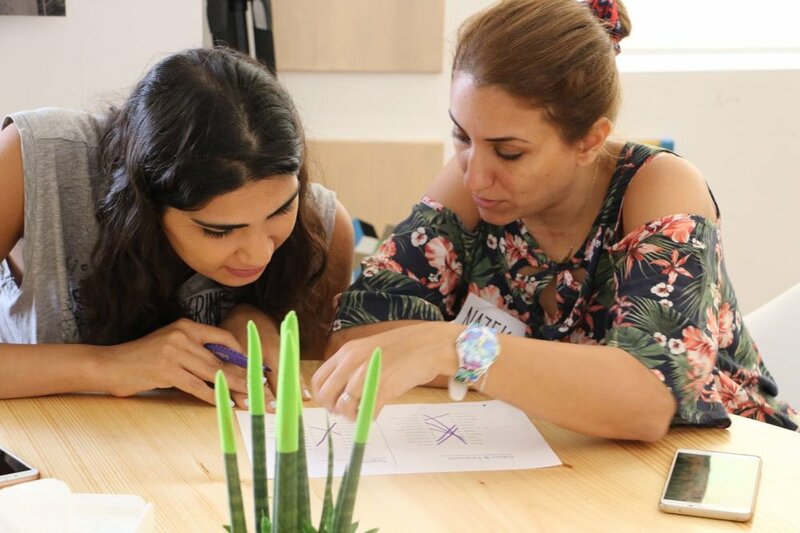 Each group was handed a map of Greater Beirut in order to perform a zoning method called the ‘love/hate map’ and were asked to point out the streets or areas they love and/or hate using colored round stickers. Some groups even decided to mention why they love or hate those areas by adding icons to the round stickers like a car for traffic and trees for green spaces. 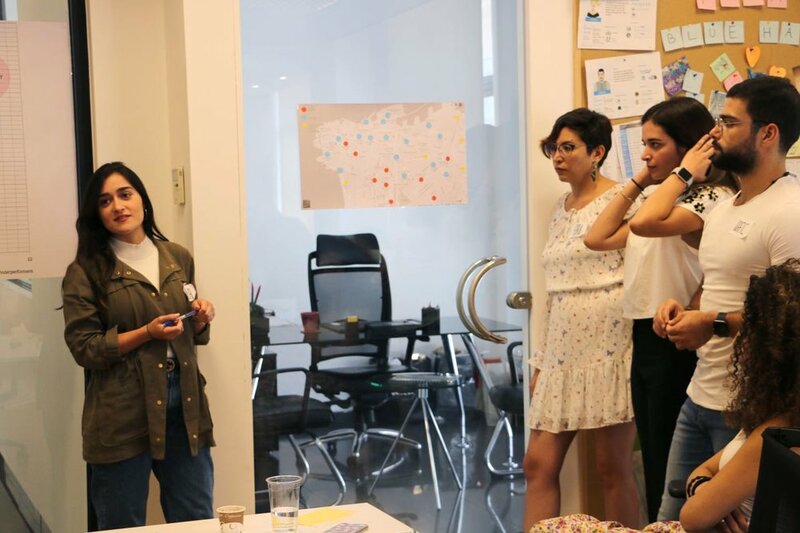 Afterwards, they were introduced to the concept of personas and brand archetypes, in order to build their own persona with needs that require solutions. They were also introduced to Wally Olins’ Brand Tangibility Model, found in his book ‘The Brand Handbook’. They had to figure out a core idea behind the plan that solves the problem they chose to focus on. Group 1 decided to focus on Beirut’s historical attractions, especially on the seaside. They aimed to create a reconciliation after the Civil War as well as reintroduce the tramway. They chose the "EGG-shaped building" as a town hall for Beirut city that hosts events, get-togethers, and is a space for citizens to discuss the city's issues. They also focused on providing public spaces such as the corniche, with separated zones for Shisha smokers, public gym, and sports / promenade areas. Group 2 focused on zoning, adding attractive zones to the city’s intersections using installations shaped as bridges. bridges, as well as focusing on the ‘good shopping’ subcategory from the Saffron’s Barometer. 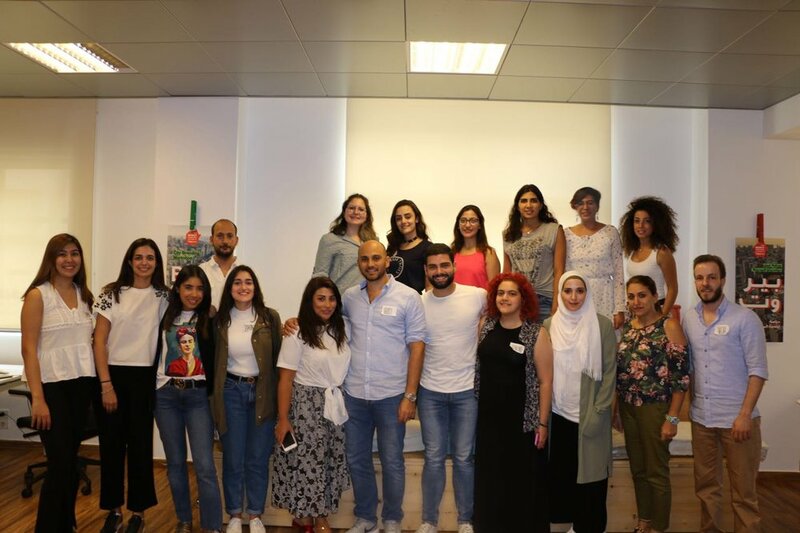 Their concept revolved around empowering Beirut's neighborhoods through high-streets that include facilities and shopping destinations for convenience and specialty / artisanal stores. Group 3 focused on improving the ‘ease of getting around on foot or by public transport’ through revamping the already existing busses, introducing proper bus stops, and a carpooling app for those who don’t wish to ride in busses. The workshop was concluded with an evaluation of the different outcomes based on 3 criteria: desirability, feasibility and creativity. 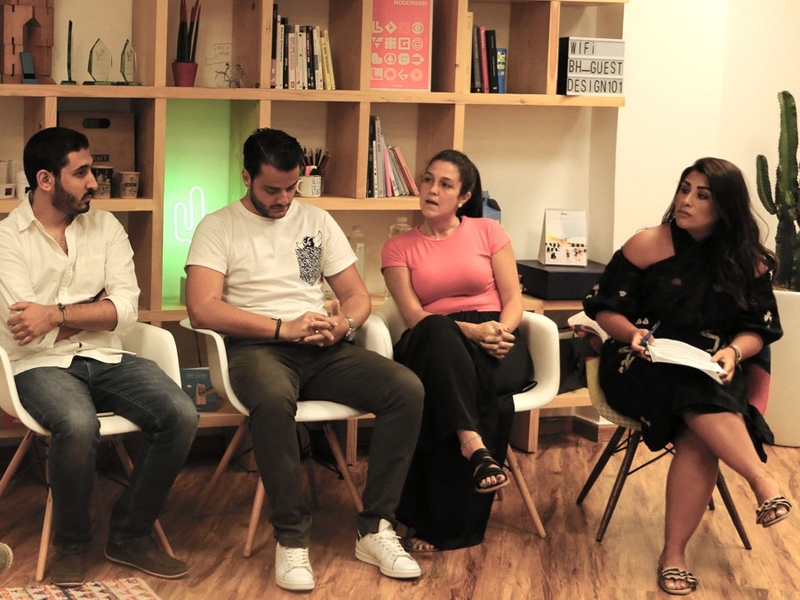 On Tuesday, June 26, Blue Hat hosted a Design Thinking talk as part of the sixth edition of Beirut Design Week. 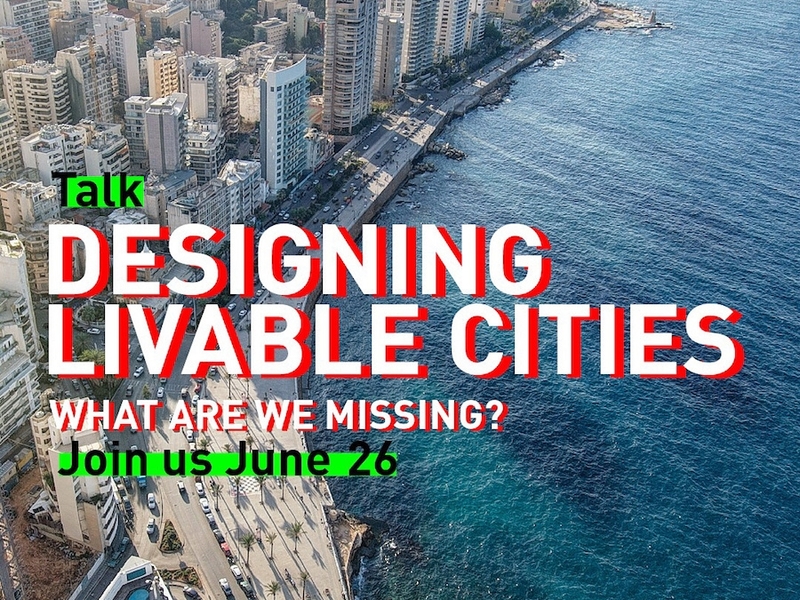 The talk, titled ‘Designing Livable Cities,’ brought together five speakers from four organizations and groups, working in different fields. 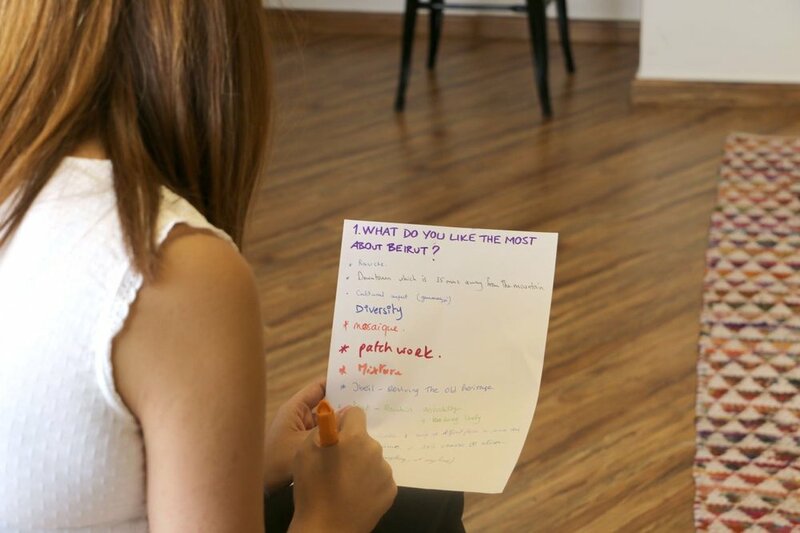 The talk's aim was to answer the question "What are we missing in Beirut?" 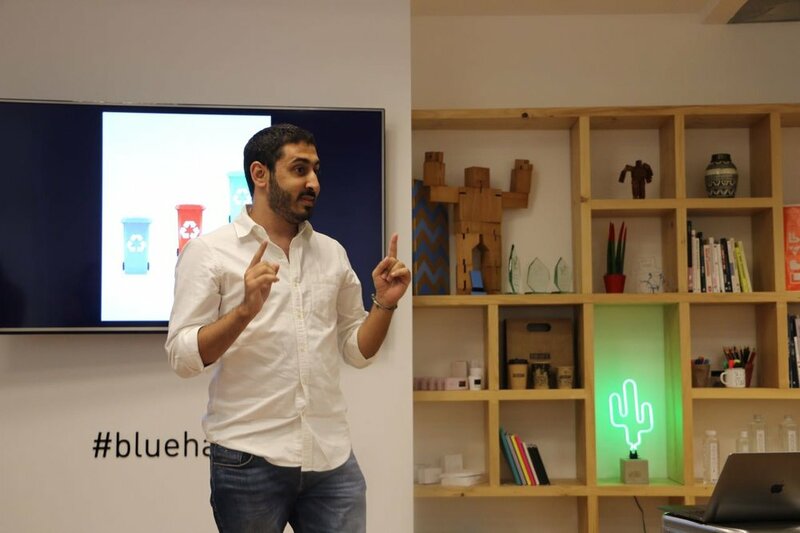 After an introduction by Blue Hat’s Co-founders, Judy Maàmari and Sami Hmaidan, the first speaker was introduced. Nadida Raad, of The Chain Effect, took the stage first. In her presentation, Raad introduced us to examples of what her group has worked on and mirrored them with what other countries are doing. The Chain Effect have recently installed a bicycle parking rack on Abdelaziz street in Hamra, in collaboration with the AUB Neighborhood Initiative, for Beirut Design Week. The installation is car-shaped to show people how much valuable street space one car takes. One car can house up to 12 bicycles. The Chain Effect are also famous for their murals and graffiti that promote using bicycles instead of cars, among other public art installations. Up next came Lana Chukri and Jubran Elias, the co-founders of Dihzahyners. In their presentation, Chukri and Elias spoke about how Dihzahyners came to life as well as the projects they’ve worked on all over the country. Their main work is integrating geometric shapes onto old, decaying big staircases of the city, to give them an uplift. Before painting, they study the area very well to see what design fits it best and tells its story. Following Dihzahyners was Georges Bitar, president and co-founder of LiveLoveLebanon who was here to talk about the organization’s newest initiative: LiveLoveRecycle. 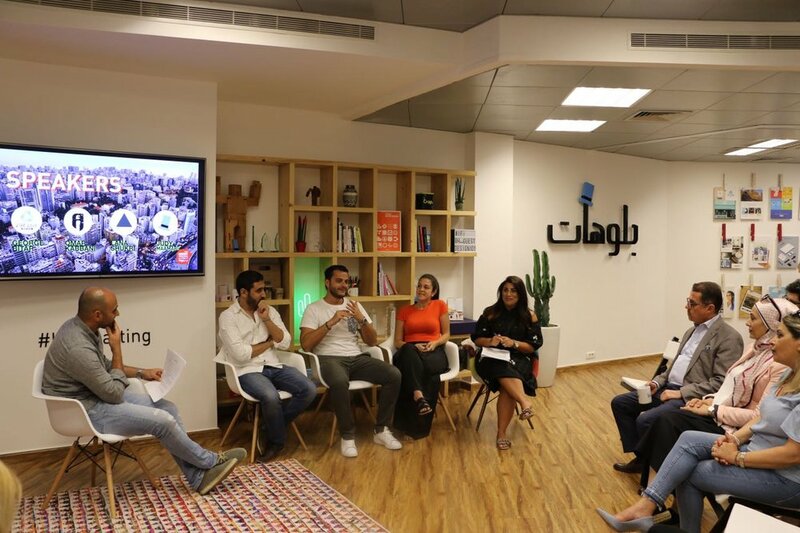 The recycling phone application was launched two months ago after the founders of LiveLoveLebanon received many tags in photos from the trash crisis filling our streets. The people using the hashtag on such photos aimed to show that it’s hard to love Lebanon in such state, using sarcasm. The application offers every household pick-ups of four small bags per month for free. We were joined last by Omar Kabbani, one of the twin brothers behind the Ashekman initiative. Ashekman integrate their designs, representative of Beirut’s identity, in three different forms of art: their graffiti, their clothing line, as well as their rap. Kabbani stressed that in all these fields, their work is entirely in Arabic. Kabbani stated that they were born in the 80s, and spent a big chunk of their childhood in shelters, so everything they knew of Beirut was the war-torn ghost of a city. He concluded his presentation with a video of the work they’ve done in Jabal Mehssen and Beb el Tebbeneh. They painted the Arabic word for ‘peace’ (salam) in green on 85 rooftops of the war-torn area, with the help of 80 locals. The event was concluded with a short panel discussion where people from the audience had the chance to ask the speakers, as well as Blue Hat’s co-founders, some questions about the initiatives they had been working on in hopes to make the city a nicer place to live in. Recently, Blue Hat took on the challenge of revamping the existing logo of renowned fashion Saudi blogger “Ar-Stylish”and include a small animation for it. Her previous logo was purely typographical, and after discussing the matter with her to understand her vision, we have agreed to keep it as such. Also a magazine fashion editor, Ar-Stylish was known for her editorial-style fashion blog that provided style tips and fashion insights for Saudi trendsetters and fashion enthusiasts. As a result, the direction of her new logo was inspired by the likes of Alexander McQueen and Yves Saint Laurent. With simple typography, the “Ar” was strategically placed in the curve of the “S” in “Stylish”, creating a sophisticated and elegant design. The “T” was merged with the “S” giving the overall look and feel of the logo a sense of sophistication and mystery, allowing the final shape to transform into a stand-alone logo. The black was chosen instead of the original navy blue s it is a classic and eternal color and is always adopted by major fashion houses. We will leave you with the small animated video of the final logo and video from Ar-Stylish's herself to see how she used it. We hope you like it as much as we do.